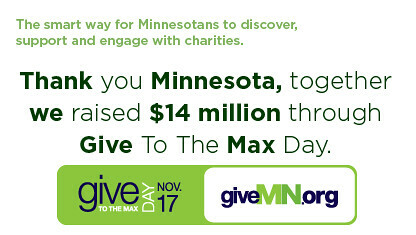 GiveMN Raises $14 Million Online in 24 Hours! I think I want to change Garrison Keillor's well known descriptor of Lake Wobegone. It goes "Minnesota from"where all the women are strong, all the men are good-looking, and all the children are above average." Let's add "and where the charitable donors are extraordinarily generous." Earlier this week, I wrote about giveMN.org as an example of local and regional online giving initiatives. GiveMN a new online resource that hopes to encourage more Minnesotans to give and help create a stronger nonprofit community for Minnesota. On Tuesday, November 17, they held their first "Give to the Max Day" competition where all donations during the 24 hour period were matched, plus there were incentives for organizations that received the largest number of unique donations. I knew it was potentially possible based on a research study funded by the The San Francisco Foundation and The Saint Paul Foundation demonstrated that high dollar donors — especially 30-49 year-olds — use the social web, but have yet to be engaged by strong, trustworthy philanthropic organizations. This was among the key findings of the “Community Philanthropy 2.0,” conducted by Geoff Livingston (he is a Society for New Communications Research Fellow), Qui Diaz and myself. According to a project staff person, "The factoid that blows me away is that more than 45,000 Minnesotans donated! More than 350 orgs received $10,000 or more. We're having lots of fun today hearing anecdotes from happy nonprofits all over the state. What we are most excited about is the number of organizations who are reporting they got new donors. The most heartwarming thank yous are from small ones who have never had online fundraising capacity before and are just thrilled." The campaigns were multi-channel using a variety of fundraising and marketing techniques, including social media. Match Days have been used by community foundations to stimulate local charitable giving. They are done in a condensed time period - 24-48 hours and local nonprofit rally for donations. Last November, The Columbus Foundation's Power Philanthropy Day was highly successful, raising over $1 million dollar. However, Minnesota has set the bar pretty high! They are estimating that more than 20,000 donors set up accounts on the giving site. Now that the recruitment phase has done a fantastic job, the next challenge is to build an active base for an ongoing community. The key will be the staff hired to make GIVEMN engaging to donors. Plans may include campaigns that are focused on particular types of charities around the state. The goal is to grow the giving pie. The GiveMN site is designed for both individuals and organizations. Individuals can browse the site and find local nonprofits and make a donation online. Or, if they want, they can launch their own fundraiser for an organization. For nonprofits, GiveMN offers simple, secure tools to achieve their goals. The site is powered by Razoo, a giving platform. I think this will be studied at length by fund raisers. To date the use of online approaches has been more about hype than results. This is perhaps one of the best results I have seen to date. I would love to see a more in depth report on how they did this. Great stuff! So proud to have worked on the study that proceeded this. Kudos to the St. Paul Foundation for this outstanding effort. Have you seen any evidence that the success was based on the "online" aspect of the event and not just the "match" and "limited time" aspects? I'd love to know that this is an example of successful online fundraising and not just traditional fundraising. Realize that GiveMN raised more in 24 hours than Facebook Causes has raised since they started. This initiative broke down the walls between traditional and online fundraising and merged the best aspects of both. That's why it was so successful. There are some that simply thought that if you build a website, donors will come. GiveMN was not so naive. The mix of personal outreach to both donors and nonprofits, coupled with an integrated blend of viral and traditional marketing was what made the difference. GiveMN from the outset seemed very authentic; the trust level was high; the communications clear; and best of all, the value equation was defined. It wasn't just about the matching funds, the fact that all transactions fees were covered so that all $14MM would go directly to the nonprofits was very compelling. I'm curious what the marketing strategy was. Aside from the nonprofit toolkit, do we know what did they did to drive traffic to their site? Was their any PSAs, TV, radio, SEM, banner advertising, etc. ?